Laying new roof of Building No. 20 in Cramp's Shipyard. 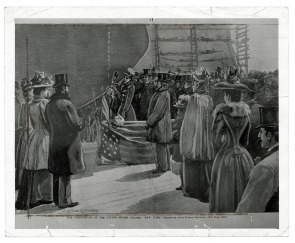 The Christening of the United States Cruiser "New York"
The Cramp shipyard, founded in 1830 by William Cramp, was a major employer of Kensington and Fishtown residents in the late 19th and early 20th centuries. 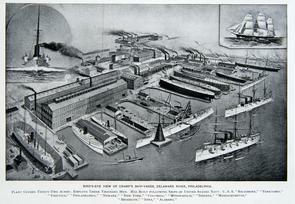 The company actively participated in the modernization of the shipbuilding industry, “from a craft mode of production focused around wooden sailing vessels to an industry centered around steam engines and iron and steel construction.” Throughout its long history, Cramp’s appropriated more and more space along the Fishtown waterfront, eventually acquiring the area that was once that massive Dyottville complex and later used by the Lehigh Coal and Navigation Company. 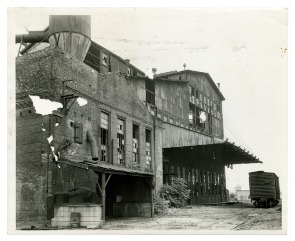 The Cramp shipyard began at what is now the foot of Susquehanna Avenue, moved to the foot of Palmer Street, and eventually came to sit at Richmond and Norris Streets (appropriating most of the space between East Cumberland Street and Aramingo Avenue). 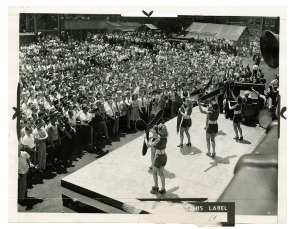 At its height during World War II, it employed roughly 18,000 men and women. William Cramp & Sons Ship and Engine Building Company grew and prospered so impressively because William's sons, especially Charles, found ways to integrate production; previously, the shipbuilding industry had been characterized by subcontracting (for things like engine production) and seasonal work. 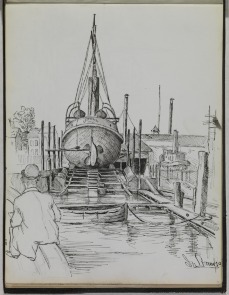 After William’s death in 1879, Charles H. Cramp attempted to control all processes involved in shipbuilding – this involved appropriating more and more space along the waterfront. 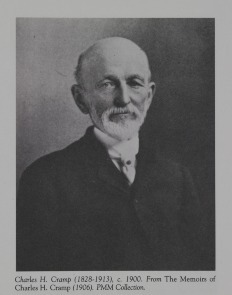 In 1891, he acquired the I.P. 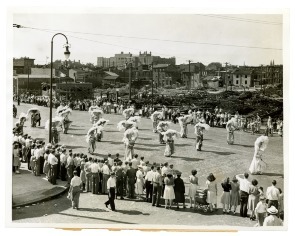 Morris Company, “one of the oldest machinery building organizations in the United States.” In 1892, Cramp acquired a Brass Foundry at York and Thompson Streets. The company grew so large that during World War I it ran out of storage space and had to use Petty’s Island as a storage yard. 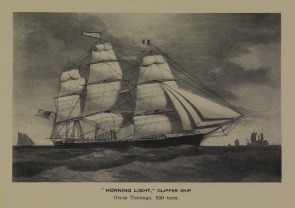 Hefty government contracts and subsidies helped Cramp’s to acquire the capital necessary to construct modern ships and expand operations without subcontracting. Cramp’s shipyard had been contracted to make ships for the U.S. Navy since the Mexican-American War, and Charles H. Cramp was a leading figure in advocating naval power as a key to national power in the late 19th century. 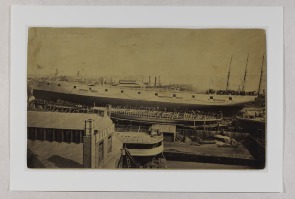 Cramp’s shipyard continued to expand: from the Civil War, in which it produced New Ironsides, a ship crucial to the Union’s fleet; through the late 19th century, when it received U.S. government subsidies yet produced ships for the Japanese, Russian, and Venezuelan navies; until the end of World War I, when the U.S. government hired it to produce 46 destroyers in three years. 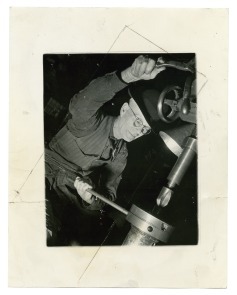 Work at Cramp’s during wartime was a way of life, in some ways paralleling what has been documented at Stetson Hats. 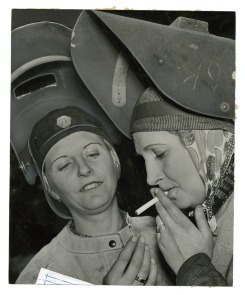 On average, wartime workers labored 53 hours per week. 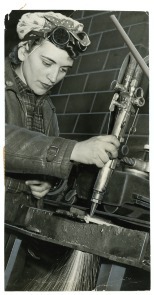 Their hours were not limited to a typical 9am to 5pm workday—for example, some spent 4pm to 12am at the shipyard and others worked overnight. 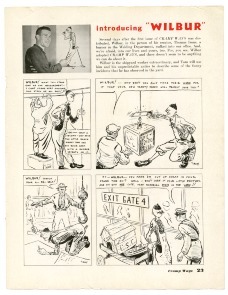 Cramp’s took a page out of Stetson’s book, producing “Cramp Ways,” a magazine for its employees that provided such things as updates on happenings at the shipyard, information on those at war, explanations for pay distribution, and comic strips designed to teach lessons. 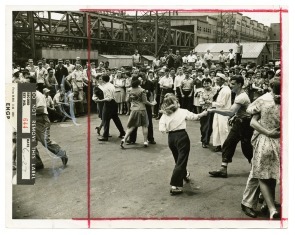 Going back to at least 1943 there were lunchtime dances twice a week; there were lunchtime follies in which Broadway actors came to perform; and there were men’s and women’s sports teams for baseball and basketball, with men participating in what was known as the Greater Philadelphia National Industrial Softball League. 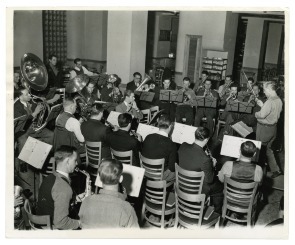 Besides having a main cafeteria, Cramp’s management took great pride in its man-sized canteens, “offering hot food in the way of soups, meats, stews and vegetables, or sandwiches, ice cream, pies and cakes,” to three hundred men each. Novel “trailer cafes,” essentially like the food trucks one finds all over in Philadelphia today, served ‘from hot dogs and hamburgers to other hot food, from sandwiches and coffee to cold soft drinks,” and were carted to various spots of the 50-acre plant; and other portable trucks that would be “brought to the side of the hull” and “lifted by a crane and raised to a top deck, or lowered into the depths of the vessel.” Yet the workers were not always as content as Cramp’s management desired—photos from the Philadelphia Record depict at least two strikes by the Industrial Union of Marine and Shipbuilding Workers of America (CIO) in both 1943 and 1944. 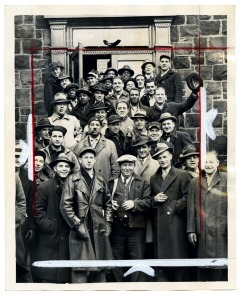 By 1946 the shipyard that had “shifted the locus of shipbuilding in this country from New York City to the Delaware Valley” had closed down for good, the site becoming an industrial park which remains today, and its multitude of employees had to search for jobs elsewhere. The last standing building, the Cramp machine shop, will be demolished as part of a PennDOT project to reconfigure the Girard Avenue Interchange on I-95. Cramp, William & Sons Ship and Engine Building Co., Philadelphia. 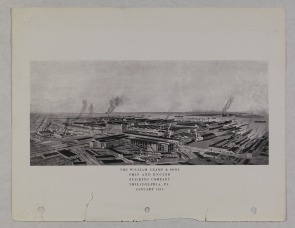 Cramp’s shipyard war activities…1919. 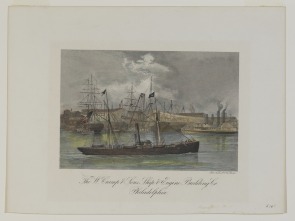 Cramp, William & Sons’ Ship and Engine Building Company, Philadelphia. 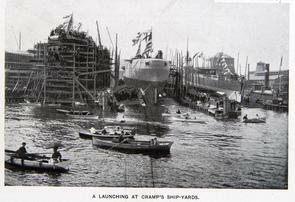 Cramp’s shipyard … [c1910]. 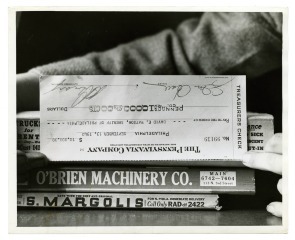 Available at the Historical Society of Pennsylvania. 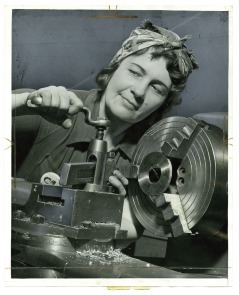 Farr, Gail E. Shipbuilding at Cramp & Sons: A history and Guide to the Collections of the William Cramp & Sons Ship and Engine Building Company (1830-1927) and the Cramp Shipbuilding Company (1941-46) of Philadelphia. Philadelphia Maritime Museum, 1991. McCullough, John, “Cramp’s Reopening Aids U.S. Defense: Modern Employee Feeding System Covers Shipyard.” The Philadelphia Inquirer. 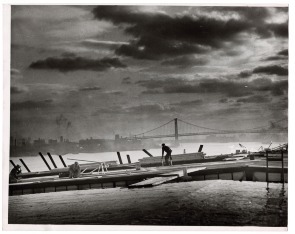 Sept. 6, 1941, Cramp Shipyard section. McCullough, John. 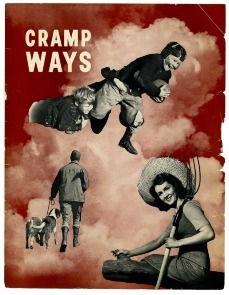 “Cramp’s Reopening Aids U.S. Defense: Defense Classes Train Workers for Shipyard,” The Philadelphia Inquirer. 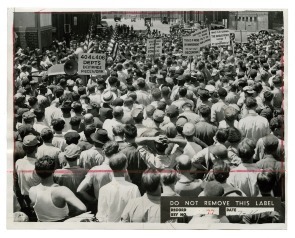 Sept. 6, 1941, Cramp Shipyard section. 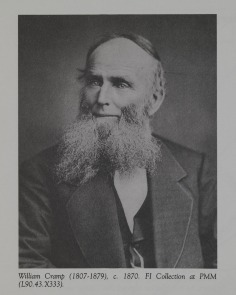 McCullough, John. 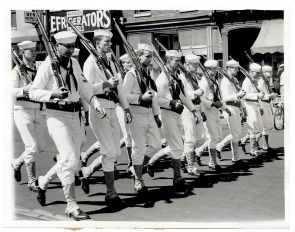 “Cramp’s Reopening Aids U.S. Defense: Kensington Will Celebrate Today as Workers in Revived Shipyard Lay Keel for Navy Cruiser Wilkes-Barre,” The Philadelphia Inquirer. 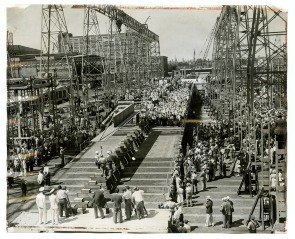 Sept. 6, 1941, Cramp Shipyard section.